The Newport Harbor Lighthouse – known locally as Goat Island Light, may not be the most widely recognized lighthouse in Newport Harbor, but it does have the distinction of being the very first sentinel established in the historic deepwater harbor to guide and protect the flourishing shipping interests of Newport merchants in the early 1800s. 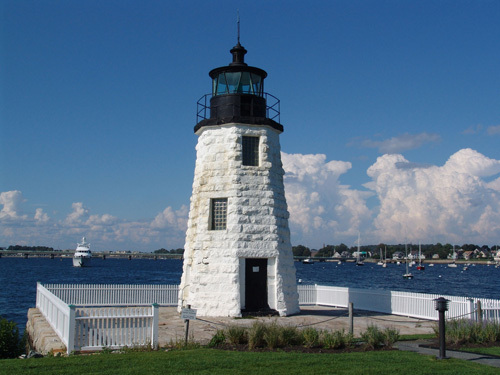 Despite the beacon’s faithful service to mariners though, the light station eventually found itself center stage in a whirlwind of dynamic change over the past century that forever reshaped Newport, Rhode Island. Historically accurate fencing was re-established around the granite pier. Future projects will include repointing and repainting of the tower. The lighthouse sits on the end of Goat Island adjacent to the Hyatt Regency Hotel.